A traditional Galloway farmhouse built in the local vernacular style of south west Scotland entirely surrounded by open farmland. This luxury holiday house is remarkably spacious. 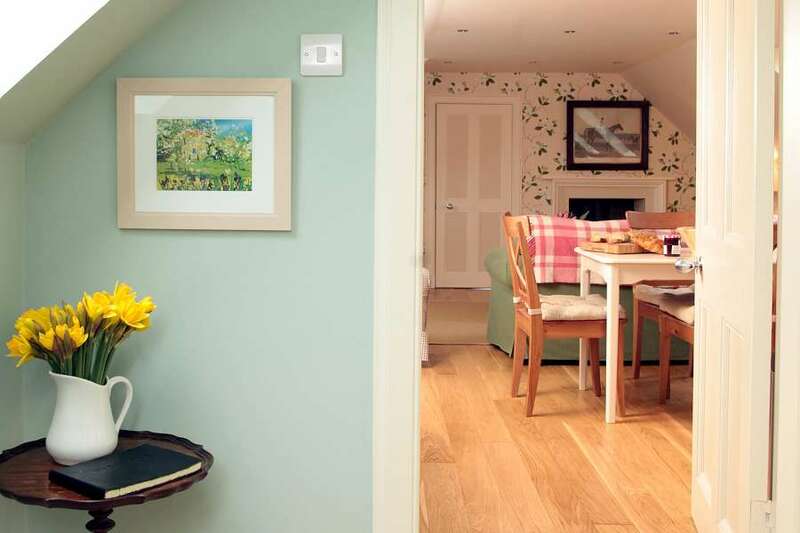 During quieter months, the cottage can also be let for four, with a price based on four people sharing two bedrooms, or two with two people sharing the double room on the ground floor. Entering the cottage on the left, there is a large sitting room, with a cosy log burning stove, furnished with a large corner sofa, various arm chairs and a flat screen television with DVD player. 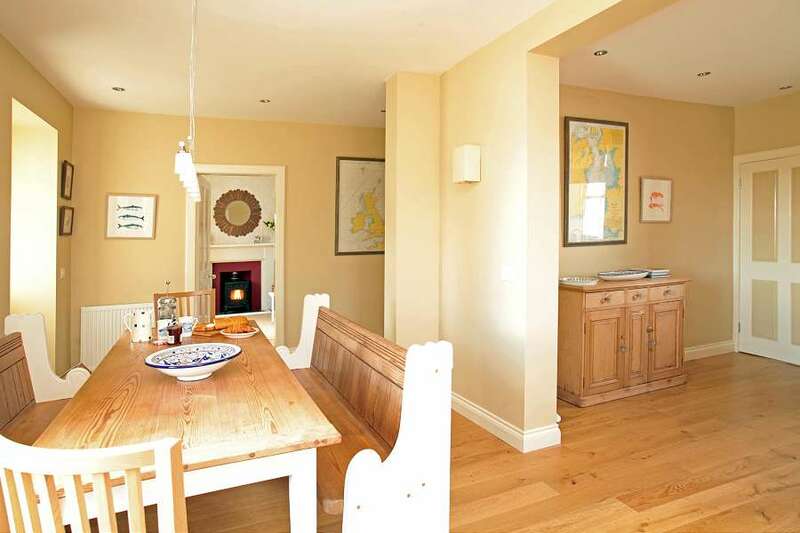 The spacious dining kitchen has large dining table with charming restored church pews as seating. Leading off the kitchen is a large south-facing conservatory with beautiful rural views of the rolling Wigtownshire countryside. With arm chairs, an additional dining table and chairs, guests can either choose to eat here, relax and take in the view, or play board games. There is a large master bedroom with a king size bed on the ground floor with pretty rural views to the south and north and an en suite bathroom with a double ended bath and a separate shower. Next door is a further bedroom with a full sized bunkbed, which is ideal if you want the children close by. Upstairs, there are two generous bedrooms, which have zip and link beds so can either be made up as twin or double (super king) beds. Full of character, these bedrooms each have the original fireplaces. 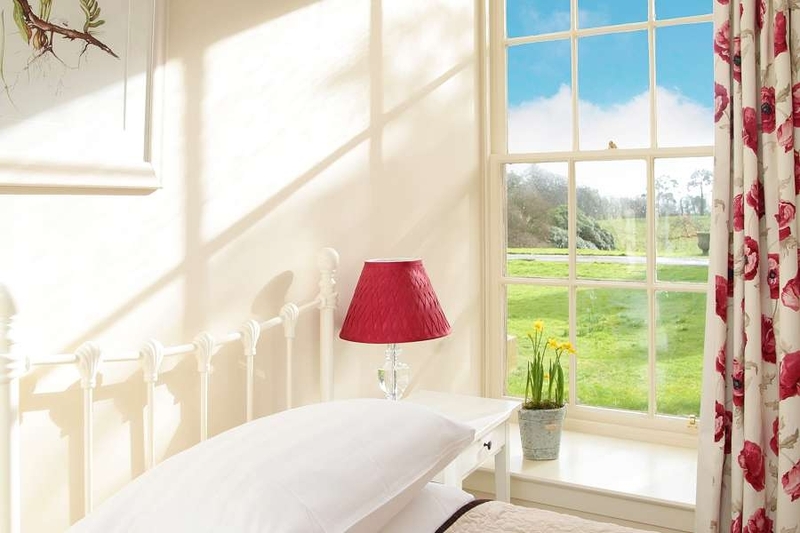 Both bedrooms have large en suite bathrooms with Victorian style free standing baths for a touch of added luxury, in addition to separate showers and under floor heating. There is also an additional house bathroom upstairs, with a bath and overhead shower. 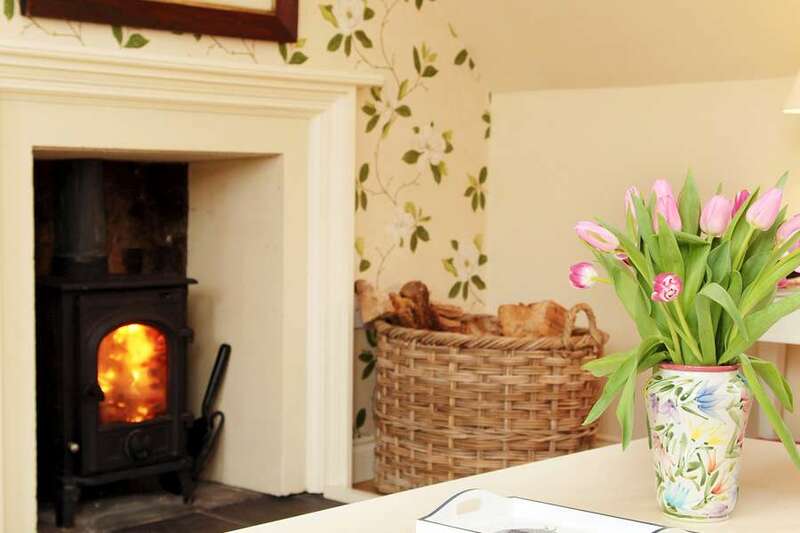 Located in the country about a mile to the north of the village of Kirkcolm, seven miles from Stranraer in south west Scotland, the sensitively restored 19th century farmhouse sleeps eight guests in four double bedrooms. The pretty beaches of Lady Bay and Port Beg are a short walk away. We’ve got lots to keep children busy outdoors on the estate. 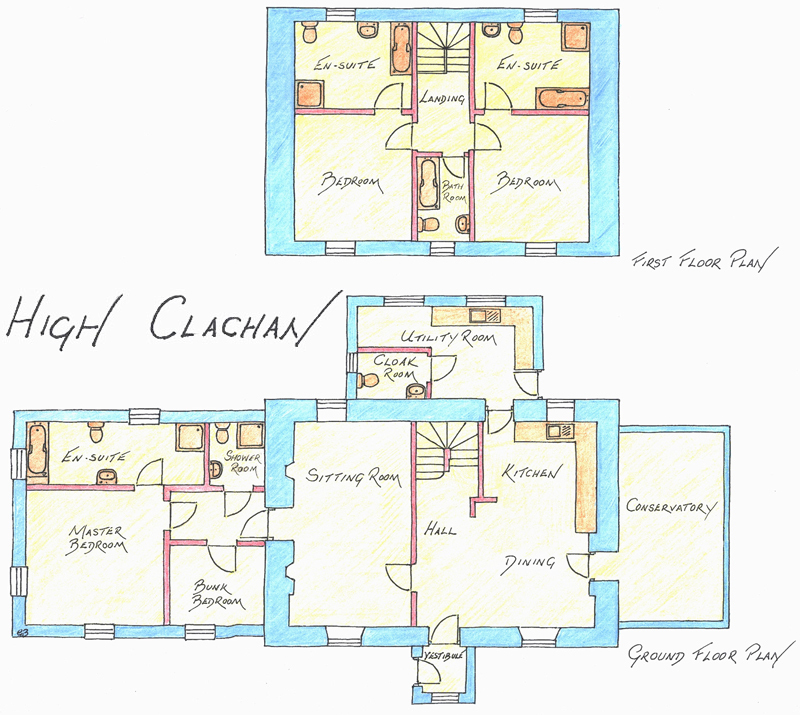 The woods, immediately beside the lawns close to Garden Cottage and Stables Cottages, which are a short drive away or a pleasant walk from High Clachan Farmhouse, are a dedicated children’s fun zone. There is a 60-foot zip wire, which has been well tested by children (and some adults) alike! Next door, there’s also a climbing frame, which comes complete with a climbing wall, lookout house with binoculars to spot pirates/baddies, a very whizzy slide, three swings, including one for toddlers and a terrific back to back glider. Additionally, kids can bounce to their heart’s content on the 14-foot trampoline on the edge of the lawns. There’s a campfire area in the woods – perfect for toasting marshmallows. We have a two man tent which guests can pitch in the woods so children can have an outside night adventure and get closer to the great outdoors. Finally, for smaller children, we have wendy house with a toy cooker and lots of picnic/cooking paraphernalia and a pretty veranda. The cottage is equipped with WiFi, a flat screen television, a Freeview Box with recording facilities, a DVD player, a Roberts radio, a selection of board games, books and classic films. 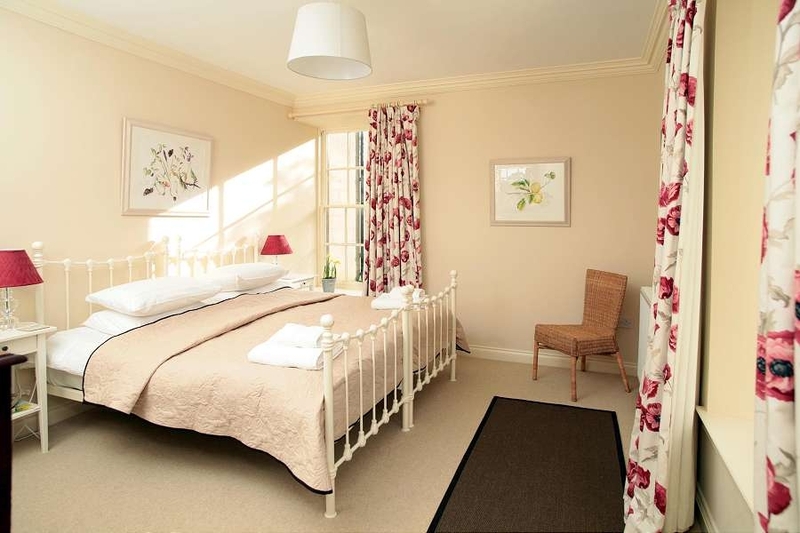 The beds come with super thick, feather-filled duvets and pillows, all linen and large fluffy towels. The kitchen/utility room has a television, dishwasher, washing machine, fridge-freezer, gas hob and electric double oven. 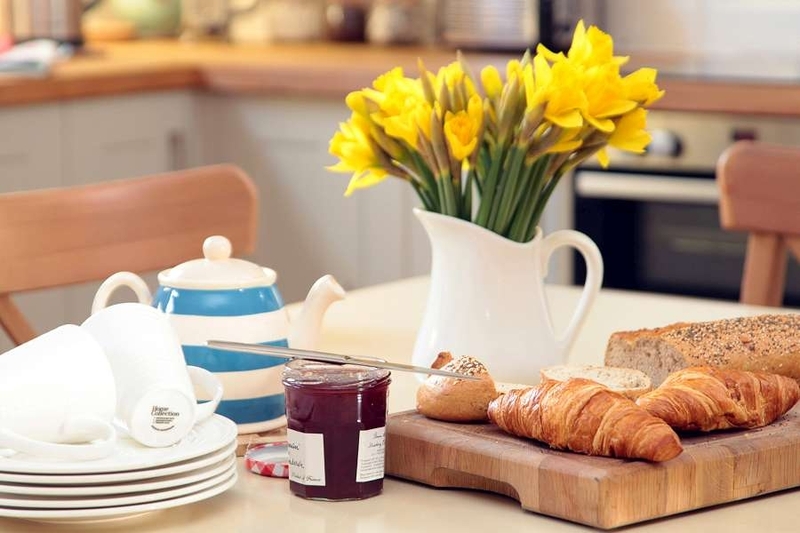 We provide a welcome pack for guests on arrival including a jar of our incredibly edible, home-made Corsewall brownies, milk, jam, butter, tea, coffee and fresh flowers from the garden (when in season). You’ll find the cottage is well stocked with the general basics too from washing up liquid and bin bags to washing powder and loo roll. 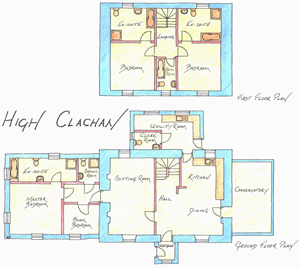 High Clachan has its own private garden including garden furniture, a barbecue and a croquet set. Cots and high chairs are available on request.